Jo Konta wasn’t happy with everything about the match. ASHLEIGH Barty has climbed back to a career-high mark of world No 16 after rolling Johanna Konta to claim a dramatic Nature Valley Open final in Nottingham. Barty, 22, secured her second WTA singles title by eclipsing a furious Konta, who refused to shake the umpire's hand after a 6-3 3-6 6-4 defeat. Beaten in her past three singles finals, Barty sustained a searing late challenge from Australian Open semi-finalist Konta in front of a partisan crowd. Ahead 4-1 in the deciding set, Barty twice regrouped - enduring a rough serving game for a 5-4 lead - and then breaking an unravelling Konta in the final game. "It is the cherry on top at the end of a great week. Jo is one of the best chicks on tour," Barty said as she collected the Elena Baltacha trophy. "Her team invited me to Wimbledon last week to practise. I have to say thanks. It helped us both." Konta stalked from the court post-match, returning several minutes later from a toilet break for the trophy presentation. The Australian-born Brit was livid with the umpire after failing to break Barty's serve in the decisive ninth game of the third set. "Oh my God, this is a joke," she fumed. "You listen to me now. "You are making decisions that affect our lives. Do you understand that, do you fully understand that?" After composing herself, Konta was in a more generous mood. "Massive congrats Ash," Konta said. "The public won't know but she is one of best girls on tour. She deserves all of the success. "She is very tough to play on this surface. I tried to do the best I can playing-wise and competed the best I could. I competed my way into the match which is a positive for me to take. "It is a very good result for me this year. There are a lot of positives to take. "It is a good feeling to be back in the last day of the tournament. I haven't had that for exactly a year. I am looking forward to doing this week in week out." 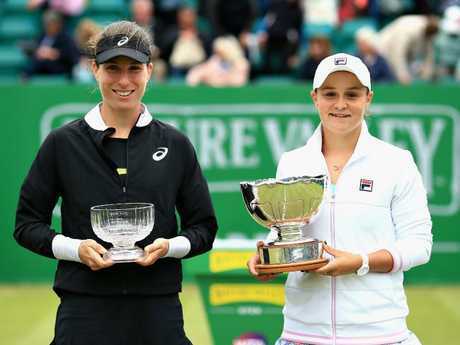 Barty and Konta will both contest the Nature Valley Classic in Birmingham this week. Barty will face a qualifier first-up, while Daria Gavrilova plays Dominika Cibulkova.